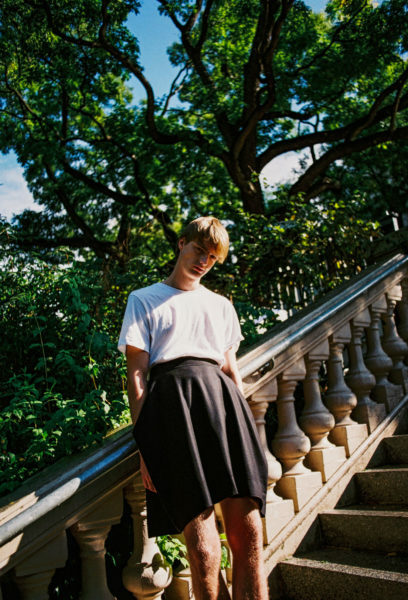 WILL 2018 FINALLY BE THE YEAR FOR MEN AND SKIRTS? A man in a skirt – these words still seem to be something of an oxymoron. A rhetoric figure that can’t be linked to a real person. Because although there seems to be a joined effort of labels to break down barriers set in motion through clothing, with designers like Thom Browne or Alejandro Gomez Palomo of Palomo Spain naturally putting men in skirts, and Jean Paul Gaultier already freeing men’s legs back in 1985, one of the biggest headlines of last year remains that British schoolboys chose, or should we say dared, to wear skirts to protest their summer dress code. If skirts manage to make the cut from the runways to reality, they quickly become misfits within menswear. A tool to stand out, and at times to rebel – because without the freeing context of a fashion show, the skirt seems to equally loose its right to exist. A surprising instance when looking at the historical context: During the 12th century, men already sported skirts – first and foremost because of their practicality, making it easier to ride and fight, and avoiding the difficulty of constructing trousers. Only about 600 years later, when the bourgeoisie started to overturn the aristocracy, did the ideal of the hard-working man in tight, muted clothes start to erupt. And as the women’s movement of the 1960s made the miniskirt a symbol for liberation, the male pendant equally successful got erased from society’s collective acceptance. Although it’s not as if pop-culture wouldn’t try and change this notion: In the 90s and 2000s Alexander McQueen repeatedly looked to his Scottish roots and showed kilts on the runway, while in 2003 the Metropolitan Museum of Art dedicated an entire exhibition to the topic “Bravehearts: Men in Skirts”. 13 years later, Jaden Smith appeared in Louis Vuitton’s Spring/Summer 16 campaign wearing a skirt from the women’s collection – and still got celebrated as a pioneer. An “Opportunity To Impact This World” is what Smith called the images on Instagram back then – a change that still hasn’t really happened, it seems. Because in fashion’s imaginary lexicon skirts equal women. They are attributed with femininity, weakness, softness, flow – influenced by an understanding of clothing, and those supposed to wear them, that has been pushed upon us since the earliest days. And this isn’t even about materials, it rather is about connotations, ideas and ideals woven into the garments. So tightly, that even after the hundredths wash they don’t seem to loosen. Fashion is celebrating the “boyfriend”-look, the industry wants women in oversized dress shirts, coolness to wear, masculinity to borrow. But if men do the same, if they decide to have a look into what has long been considered a female wardrobe, there suddenly is no more coolness, no movement towards strength and self-fulfilment. Even though, or maybe exactly because of, the much bigger rule breaking. Expectations of masculinity still seem to weigh way too heavy, especially outside the realms of fashion. As much as designers try and subvert the connections of clothes and gender, as much as they work beyond the borders of the body, as little of this progress actually finds its way into the mainstream. 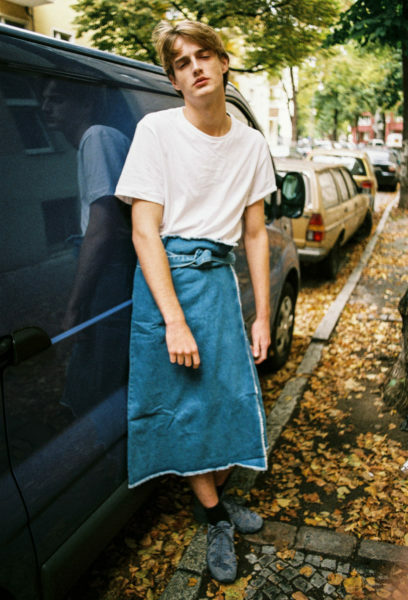 There, almost exclusively feminine attributes are still projected onto skirts, suddenly turning a single piece of garment into a symbol for this gap – and making it into an important and all the more timely tool for men to rebel with. Focusing not on slogans, but on social significance.